Clam and shade on a sunny late June morning. 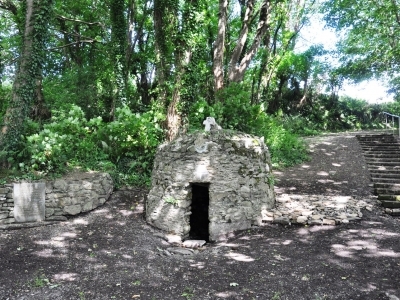 June is the time to visit St John’s Well. Trees encase the site, as the beehive structure encases the well itself. Noises drift in from out of sight, while rays of sunlight piercing the canopy catch the broken glass spread across the ground, asserting the space’s hosting of other activities. A small flow of water gently emerges, the water which restored sight and started veneration. 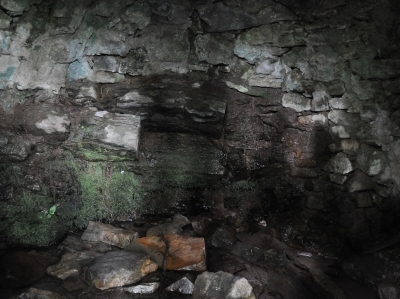 The edge of the well, the small rectangular entrance, is the cusp. The exact point of significance, the well water is accessed here before flowing off, the sacred diluting into the profane. Within the well another realm awaits. An inner sanctum, the tabernacle within the church. Reaching down to collect, to drink or bless draws you into this sphere. The cooling ambiance of the water, the reflections onto the vaulted walls, sparkle and shade on rock, moss and mould. Inside the beehive structure is reminiscent of subterranean consistency. It is calm here, removed from that which is outside. Temperate, dusky and muted; perhaps it always is. The steady dripping of the water is a further layer of consistency. It captures an essence of the place. Always present, known but unobtrusive. It invites reflection and appreciation. The water – the substance of the well – emerging from the earth, gathering and flowing. It quietly splashes and echoes about, the reverberations affirming the chamber. Water sounds defining purpose and giving space. Within the well remains. A steady emergence: earth, water, well.